Divine Face. A Human Face. Your Face. An art opening featuring local iconographers: Miron Kerul-Kmec, Jr.; Deborah Lee; Theresa Plishka; Christine Uveges, Eikona Studios; and Marek Višnovsky. Enjoy your Life By Jad Fair. Black and white cut paper stencils. Seminal punk rocker from the band Half Japanese. Rock show afterwards at Pat’s in the Flats. The public is welcome to join Jewel Heart members in an evening of coffee, tea and a variety of cookies and low-carb refreshments at 7-10 p.m. We are learning to play an ancient Tibetan dice game called Sho. Jad, Library Time and Alan Madej. We are going to charge a $10 donation to pay for Jad’s airfare. Music by Lo Watt Radio at 10 p.m.
Tues – Fri, 10 a.m. – 6 p.m., Sat. 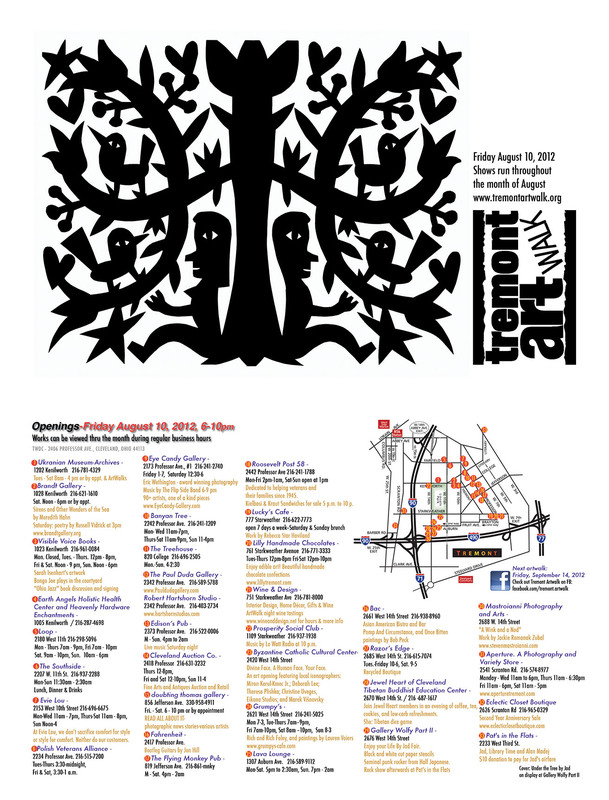 9 a.m. – 5 p.m.; ArtWalk 6-10 p.m.